Whether you’re paying off your student loans or staring down retirement, you know you need to get your sh*t together financially. But all that financial jargon gives you nervous flashbacks to your Econ 101 class, so you tell yourself you’ll figure it out later. After all, how can you get started if you can’t even speak the language? Compound interest: When people say that “my money makes money for me,” they’re talking about compound interest. Investments are composed of two parts: the principal (the original money you put in) and the interest (the part that grows over time). With compounding interest, you’ll collect interest on both your principal and any previous interest you’ve earned. By saving money, you’re making money. The average interest rate on the stock market since 1929 has been around 7-8 percent. If you earn the same average return of 7 percent on your investments over the next 20 to 30 years, plus compounding, you’re setting yourself up for a much more comfortable retirement. And the sooner you get started, the more you can take advantage of these serious savings. Portfolio: A solid financial strategy will have multiple financial assets with varying levels of risk: your bonds, your stocks, your savings etc. Group them all together, and that’s your portfolio. Liquidity: Emergency! You need to get your car fixed, stat. You can whip $700 out of your wallet, but you can’t exactly give your mechanic your $700 stock option. Liquidity measures how quickly and easily you can convert different financial assets into cash. Cash, savings and checking accounts are considered the most "liquid," while CDs, stocks and mutual funds are harder to change to usable funds. Broker: So you don’t have the time or know-how to suss out and sell stocks on top of, you know, your real job. Brokers are people and businesses who, for a fee, will do the dirty work for you. Discount brokers will buy and sell orders that you place online for around $5 to15 per transaction. Full-service brokers offer more advice on retirement planning and investing, but they’ll charge a higher commission for it. Income statement: Consider this a report card for your investments. The income statement will provide some information about the company’s performance (over a specific time period) that affects its stock price, including its sales and earnings per share. Consult statements to select and evaluate your stocks. Net worth: Net worth is a simple calculation of a company's total tangible assets (basically everything but copyrights, patents, and intellectual property) minus the company's debt. Capital and capital appreciation: If you’re investing in a company, you also need to guess how it’s going to perform next year -- and the year after that. As we’ve seen often, even the most profitable companies can fail quickly if they generate a PR controversies or a competitor beats them to a new technology. Capital signals a company’s future strength, measuring both its revenue and the people, technologies and tools it can use to gain more revenue later on. If a company has more capital, more people will invest in it and its stock price will rise. So when companies use their profits to improve their products or the company itself, they’ll increase their capital and their stock price. When that happens? Your stock is now worth more (i.e., the capital has appreciated), and you can sell it for a profit. Dividends: Other companies will share their profits directly with stockholders in the form of a dividend (either with money or more stocks). 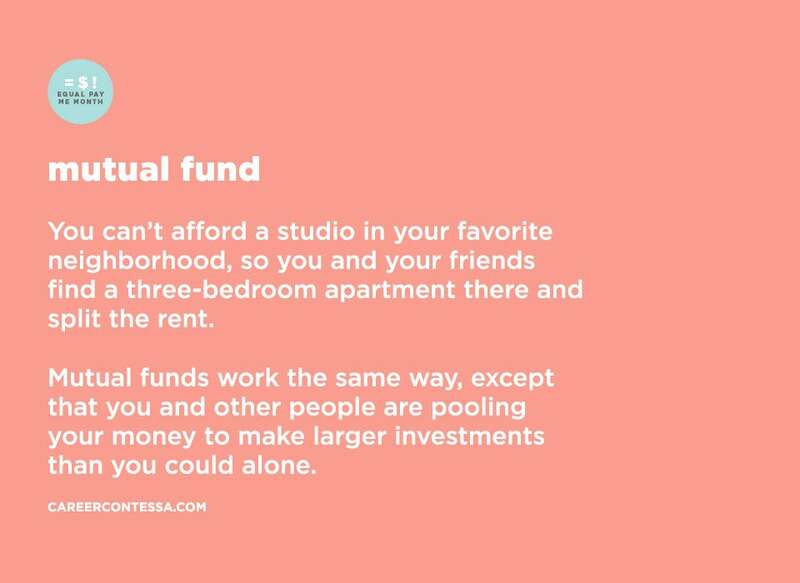 Mutual fund: You can’t afford a studio in your favorite neighborhood, so you and your friends find a three-bedroom apartment there and split the rent. Mutual funds work the same way, except that you and other people pool your money to make larger investments than you could alone. Money managers will invest it, and your group will receive the ultimate earnings (or losses). But because you’re holding professionally managed stocks in a range of industries, mutual funds are typically less risky than individual stocks. Certificates of Deposit: Think of Certificates of Deposit (CDs) as savings accounts with better interest rates. You’ll make a deposit, then let it sit for a predetermined amount of time and get a predetermined interest rate period on it, making it a relatively low-risk investment. CDs offer the same advantages of a savings account, with more interest, but there’s a catch: If you withdraw your money before the CD’s expiration date, you'll face a major financial penalty. Maturity Date: The date that the CD expires and you get your money plus interest. Pension: A pension plan requires employers to contribute to a fund for your retirement. The company invests that money into stocks and bonds, and the earnings become your salary once you retire. Most companies also allow workers to contribute part of their own income to their pension fund, typically via a 401(k) or a 403(b) plan. 401(k): A 401(K) is an employer-sponsored retirement plan that you can contribute to directly and automatically, from your paycheck. You won’t have to pay taxes on it until you withdraw it (starting at age 59 ½ without penalty for all retirement plans). Many employers will also match your contributions up to a certain percentage, which means free money. 403(b): A 403(b) is essentially a 401(k) for employees of nonprofits. 529 Plan: A 529 plan is a college savings plan, which some employers now offer alongside retirement plans. Like 401(k)s and 403(b)s, you can contribute to 529s straight from your pre-tax income. In several states, you can use a pre-paid tuition plan to pre-pay future tuition costs at participating colleges. If your state doesn’t offer a pre-paid option, choose a 529 savings plan, which invests in stocks and bonds. As long as you spend your earnings on qualified college expenses (typically only tuition), they won’t be subject to federal or state taxes. Defined Benefit Plans & Defined Contribution Plans: Defined Benefit Plans and Defined Contribution Plans are essentially the same as 401(k)s.
If you’re a freelancer or business owner, you won’t have access to an employer-sponsored retirement plan. But anyone can open an Individual Retirement Account on their own, though their contribution limits are slightly lower than 401(k)s.
You’ve got two choices: a Traditional IRA and a Roth IRA. The difference between them comes down to taxes. For a Traditional IRA, you won’t be taxed on any of your contributions now, but you’ll have to pay taxes on your withdrawals in retirement. 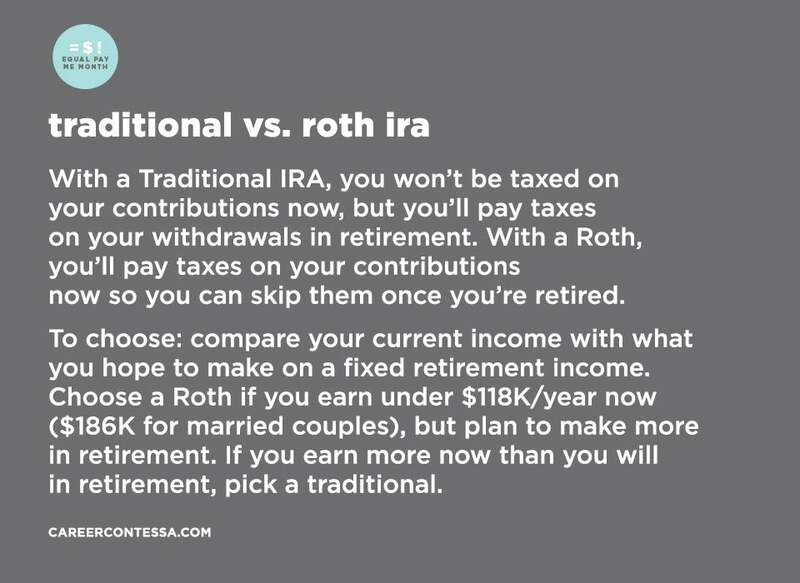 With a Roth IRA, you’ll pay taxes on your contributions now so you can skip them once you’re retired. To choose between the two, compare your current income with what you hope to make on a fixed income when you retire. Choose a Roth if you’re currently earning under $118,000 per year ($186,000 for married couples), but plan to make more in retirement. If you’re rolling in cash now and cutting back in retirement, pick a traditional.